Mmmm, bacon. A sampling of what the Stamford Smokehouse, opening soon in the former Home Slice Deli, will have to offer. Photo from the Facebook page of NY Farm 2 Door, a mobile butcher shop whose owners are behind Stamford's newest eatery. Two local food businesses are making the move from mobile units to brick-and-mortar restaurants in Delaware County this fall, resulting in a stretch of Route 23 sprouting two new barbecue joints. On Stamford’s main drag, the former Home Slice Deli is undergoing a transformation at the hands of Mike Solyn and Caitlan Grady. The couple founded their butcher shop, NY Farm 2 Door, to bring grassfed beef, pasture-raised pork and house-cured charcuterie from the Catskills to customers far and wide using four wheels. The truck also serves ready-to-eat foods such as grass-fed beef hot dogs and hamburgers, and is a regular at the Empire State Plaza in Albany. This month, they plan to open a combination butcher shop and barbecue joint called the Stamford Smokehouse. The new eat-in or take-out venture will serve barbecue staples such as pulled pork and beef brisket as well as specials like whole roasted pigs. The couple's love affair with local meat extends into the dessert menu: Solyn and Grady make apple cider doughnuts fried in heritage pork lard. The former deli has a large kitchen but only about a half-dozen seats, so it will not be a formal sit-down restaurant, Solyn said. The butcher shop side of the business will include a variety of charcuterie such as head cheese, scrapple and blood sausage made in-house. The business sources a lot of its meat from their Jefferson neighbors Bill and Carol Parker at Horton Hill Farm, and from Sweet Tree Farm in Carlisle. Solyn is a graduate of the Culinary Institute of America and a cooking school in China; the two met while working in restaurants downstate, where Grady kept quite the backyard garden in Queens. (In 2010, a blogger posted this adorable account of Grady's transformation of a Woodhaven backyard from garbage dump to micro-farm, complete with four tomato varieties and a few quail.) Grady also makes and bottles a line of hot sauces under the name PigLips. The two have catered weddings in Bovina and parked their truck for pop-up dinners around the region, including one at Bloomville’s Table on Ten this summer. "We do everything ourselves," Solyn said this week from his new kitchen at 103 Main Street. "We’re kind of a big mix-up." Down the road a few miles, the Catskill Mt. BBQ mobile unit that has made its home in a parking lot along Route 30 in Gilboa is moving to a new permanent spot at the intersection of Route 30 and Route 23 in Grand Gorge. Father-and-son team Dan and Don Mowers plan to open in mid-November, specializing in whole roasted pigs and traditional-style barbecue, including slow-smoked beef brisket, pulled pork, St. Louis-style ribs and chicken. Sides such as cole slaw, potato salad and corn on the cob round out the menu, which is also available for catering. This story is part of our growing coverage of local farms and restaurants. Want more Catskills food news? 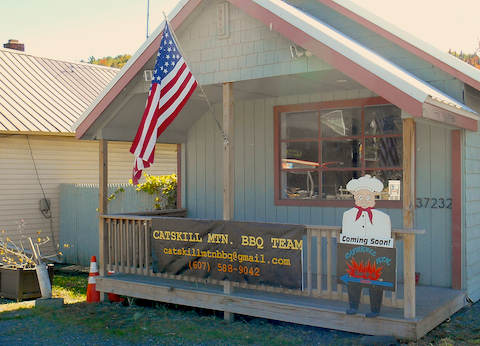 Head over to our Catskills Food Guide page on Facebook and hit the Like button, or follow us on Twitter @catskillsfood. Look for our Catskills Food Guide in print and online next month. Below: Catskill Mt. BBQ gets a new home, sans wheels.